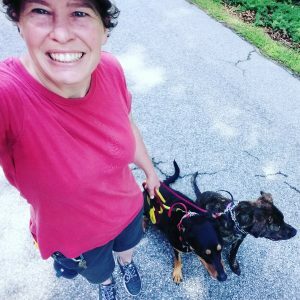 Raleigh dog trainer Amy Griswold works hard to provide you and your dog the best training ever! Being able to have a lifetime of fun and adventure together with your dog is amazing! Plus, with the ability to handle whatever obstacles may come up in your journey, you’ll be all set! Amy trains only a few dogs at a time. She has plenty of energy and time for each individual dog. And, she uses a variety of training methods and tools. No cookie cutter approach here! Amy evaluates each dog for what will work best and what approach to take in training. She is relentless in her search to solve dog behavior problems. She wants families to be able to truly enjoy their dogs! 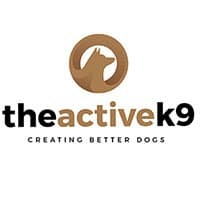 She also has amazing and dedicated clients who are the reason dogs trained at The Active K9 have continued success. Practice at home, maintaining necessary rules and structure, and being believable leaders helps dogs succeed! See Amy’s current training activities and how dogs progress with her on Facebook! Hi! Let me tell you a little about myself. I am a true Renaissance woman. I do web development and have a BA from UNC-CH. I have coached amateur boxing at the international level and even ran my own boxing gym. I grew up overseas as a military kid and had many great travel experiences before finally settling in Clayton, NC (just south of Raleigh). My current hobbies are horseback riding and competitive shooting. ​I am a member of The International Association of Canine Professionals and am fully licensed and insured. I have trained with world-renowned trainers Jeff Gellman of Solid K9 Training, Sean O’Shea of The Good Dog Training and Rehabilitation, and Victoria Smith of Take the Lead K9 Training. I attended Train the Trainers Launch Program, and I continue to educate myself at dog training seminars and clinics whenever possible. In addition, I am an authorized dealer for E-Collar Technologies. The Active K9 serves the Raleigh Durham area (including Cary, Apex, Chapel Hill, and all of Wake, Orange, and Johnston counties. We specialize in private dog training, dog and puppy obedience training with board and trains, and behavior modification. Any dog, any age, any breed. All dogs can learn!